Fall can’t come fast enough for me over at That’s My Home. I moved to Florida at the beginning of the year and this is my first summer in Florida and it has been so hot! I’ve been patiently waiting for the temps to go down but now I am beyond ready for that to happen. I bought some apples last week in anticipation of Fall. I was thinking if I started cooking Fall recipes I could at least pretend it was cooler. I love the smell of apples cooking especially when they are coated with cinnamon, which is why this Caramel Apple Bread Pudding is such a huge hit. I went outside just to come back in the house so I could get the full effect of that smell when you walk in the door. Okay I know that is a dumb thing to do but I did it and now I have told on myself. 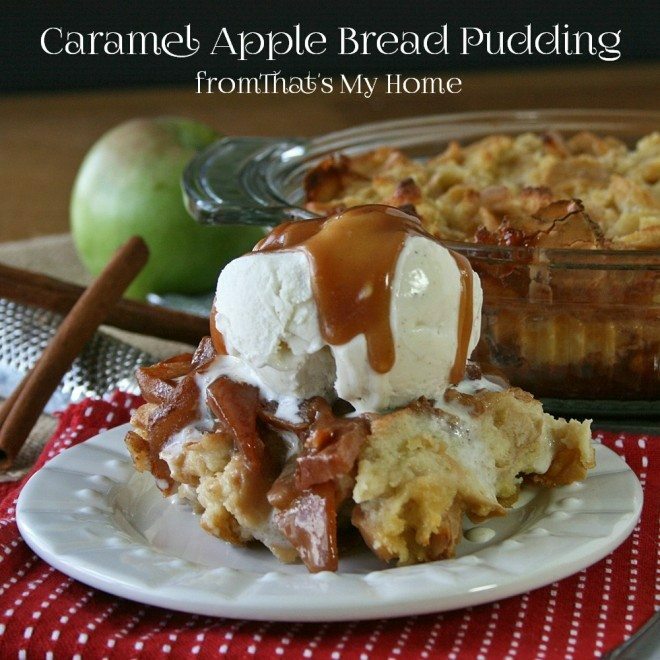 Hi Mary Ellen, your Caramel Apple Bread Pudding looks amazing. Your photos are gorgeous. Can’t wait to try this recipe out! My mouth is watering as we speak! Pinned! You should add to that apple bread pudding that a cold *glass* dish stored in the refrigerator should be put into a cold oven. If a cold glass dish is put into a hot oven it will break. Great apples recipes. They all look so delicious. I can’t wait to try them this fall. The weather here in NJ is perfect for baking. Thanks for sharing. Does the water remain in the pan after removing the apples? Does the water become part of the butter mixture? I was wondering do you have to use French or Italion bread. Can you use just plain bread.